The aim of this work package is to investigate, establish metrology and contribute towards standardisation for key parameters, such as coupling loss, attenuation, crosstalk and BER, of short range interconnects for the communications, medical and engineering industries. The partners will also aim to leverage their engagement with the standardisation working groups and committees (e.g. IEC TC86 and its JWG9) to refine current standards in progress and, if possible, develop new standards for optical circuit board measurement. Where possible, the partners will participate in multiple round robins to comparatively evaluate reference artefacts and instrumentation. The aim of this task is to evaluate the applicability of common characterisation methods for fibre interconnects to high power operation. All high power fibre systems consist of multiple components which need to be interconnected. These connections can be permanent, which can be achieved by fibre splicing, or flexible, using different types of connectors. Since these interconnects are a natural bottle neck for high power systems, inducing loss or stray light, there is significant need for reliable characterisation methods. This task will examine whether and how widely used fibre connectors can handle high average powers, and how their parameters change in the process. Spliced fibre connections of high power fibres will also be investigated by a combination of refractive index profilometry and beam propagation simulation. Furthermore, cladding light strippers, which are crucial to operate many high power fibre interconnects, will be in the focus of the task. The aim of this task is to develop and test advanced fibre-to-chip coupling solutions. The focus will be placed on out-of-plane chip access, which is the preferred option for multi-fibre chip access. This will be achieved by investigating several types of access components, namely mirror enhanced focusing grating couplers, 3D broadband coupling devices and 3D printed optical structures. The coupling devices developed will cover two aspects of the requirements described above: high coupling efficiency and high coupling bandwidth. In addition, recent improvements in the capabilities for fabricating high quality optical components by 3D printing enables utilising optical structures for fibre-to-chip coupling, which will be investigated in this task. The activities will be supported by development and use of finite-element based fast numerical methods for simulating fibre-to-chip and chip-to-fibre coupling. This includes automation of numerical models for metrology setups. The methods developed will then be tested. converter, computed using adaptive finite-elements. The aim of this task is to establish metrology for waveguide-based photonic devices by addressing some of the operational challenges of this platform (birefringence, thermal dependence, fabrication limitations), and to fully take advantage of the advances by the project in the practical case of a high-resolution Spatial‑heterodyne Fourier Transform (SHFT) microspectrometer. 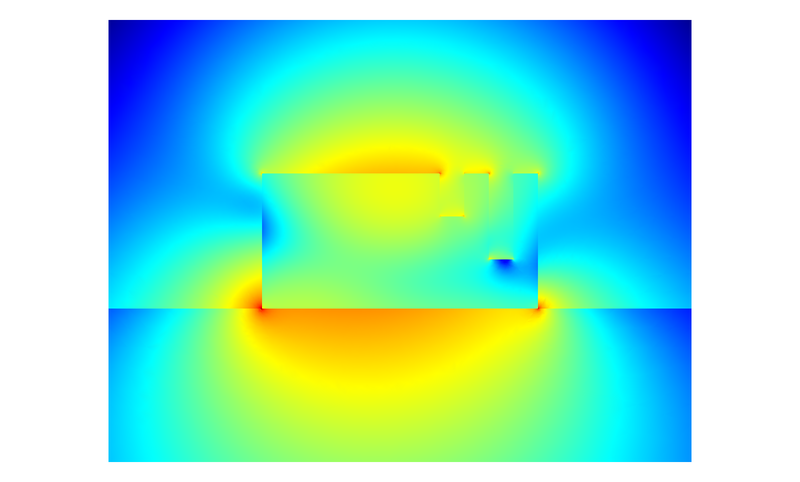 In order to establish metrology for photonic devices, additional numerical modelling will be applied to quantify and mitigate effects which cause deviations in experimental performance of these devices from their design parameters. In particular, dimensional deviations due to fabrication tolerance limitations or inaccuracies can modify waveguides’ dimensional properties and therefore hinder their optical performance. Furthermore, small temperature changes during operation can alter waveguides’ effective refractive indices and modify their optical properties. 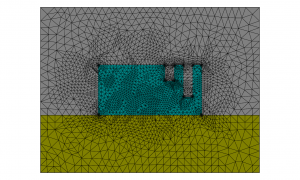 Both effects will be addressed through finite-difference simulation in order to achieve more robust designs and to accurately determine the expected operation ranges. An additional factor to be accounted for when establishing metrology in any photonic device (including fibre‑to-chip couplers and optical interconnects) is the birefringence of optical waveguides. Since TM and TE modes behave significantly differently as they are coupled and propagate through the chip, compact and efficient polarisation-handling elements become a necessity in order to perform accurate metrology of the devices. In particular, ultracompact polarisation converters based on subwavelength trenches and hybrid‑mode guiding will be studied for this purpose. Finally, one of the waveguide-based photonic devices which most benefits from enhanced multi-fibre light coupling and metrology in integrated photonics, namely a high-resolution Spatial-heterodyne Fourier Transform (SHFT) spectrometer, will be studied. On one hand, advanced fibre-to-chip coupling enables full advantage to be taken of the multi-aperture input configuration of the devices. On the other hand, and given the interferometric nature of the measurements, operation of the device is based on a precise spectral calibration that is later used for spectral retrieval of the input spectrums. In order to fully benefit from the developments by the project in those regards, a new generation of SHFT spectrometers with more robust behaviour will be studied. Multiple approaches to increase their robustness against thermal variations and fabrication imperfections will be considered, including both hardware and spectral retrieval modifications. SHFT microspectrometers will not only serve as a practical recipient of the advances of this project, but, given their high resolution and reduced footprint, could also become a useful tool for the systematic and precise characterisation of photonic interconnects. The aim of this task is to develop metrology for optical printed circuit boards (OPCB) by implementing a characterised measurement system incorporating a variable launch condition to monitor board performance under a range of controlled environmental conditions. There is currently a need for the data communications industry to understand the performance within the working environments of OPCB as backplanes in data storage server/systems. The interconnect boards are subject to environmental effects such as temperature cycling and ageing, thermal gradients i.e. proximity of board hotspots and humidity variation as well as the manufactured guide quality. The aim of this task is to develop measurement standards and standard measurement procedures for terahertz transmission systems by investigating the operation, functionality and characterisation of THz links. THz communications links aim to provide cable-free interconnects for IT installations such as server banks, data warehousing and mainframe computers. Cable-free links have the advantage of easy setup, maintenance, repair and reconfigurability, as well as reduced heat generation. Widespread uptake of THz links will require standardisation of equipment and testing procedures similar to those adopted in fibre optic and wireless communications.